A beautifully shot film in crisp high definition video, Fish Eyes (Yu Yan) is set in Inner Mongolia (i.e. Western China). An old man and his son (aged around 20?) live on the edge of the desert close to a large town. The old man grows sunflowers and operates a primitive truck stop post for the trucks visiting a water utility project. The son has no visible means of support and rides around on a motorbike, meeting other young men and taking part in petty crime. One day a young woman appears and the old man takes her in. She is seemingly mute and later the son uses her to pay off a debt (he has slept with the girlfriend of a local gangleader). Things take a predictable turn from this point, but there isn’t much plot and perhaps that’s the point. These lives are inconsequential – though there is tragedy. What events do occur are played out against a backdrop of occasional news stories about the Beijing Olympics and the Sichuan earthquake – stories about China that reach the outside world. The writer-director Zheng Wei (who also edited the film) is clearly making some kind of comment by including a large mirror, bought by the son, which when it is being moved creates rippling images across the screen. Later the mirror is broken by a motorcycle gang and we might possibly want to consider something about the image of China, created by a powerful centre, but fragile when exposed to contrary views? The mysterious girl who turns up when the old man is fishing. Zheng is Chinese, but he is a student at a university in Seoul and the rest of the crew seem to be Korean. The film was shot in 18 days on a budget of under $40,000 with non-professional actors. The images are remarkable. The camera is mostly static, but sometimes moving imperceptibly as if questioning the stability of the setting. The city, the old man’s house and the fields/desert are not particularly attractive, but the camera framings lend them a quality through good composition which means that we don’t mind watching intently. There is no music (apart from the plucking of an acoustic guitar which at the end of the film the father appears to bury) and precious little dialogue. When the violence comes it’s off-screen or the screen is darkened. I’m not sure what to make of this. Is it sensible to see this work as allied to the concept of the ‘Sixth Generation’ of Chinese directors or has that gone now and been replaced by a simple split between ‘independent’ and ‘studio’ films in the Three Chinas? The setting and the behaviour of the son reminded me of the work of Jia Zhang Ke in films such as Unknown Pleasures (2002, China/Japan/France/South Korea), set in a similar industrial city in Northern China. But that film had a kind of romantic quality associated with the slacker sensibility of young men and the vitality of a young woman as a performer. 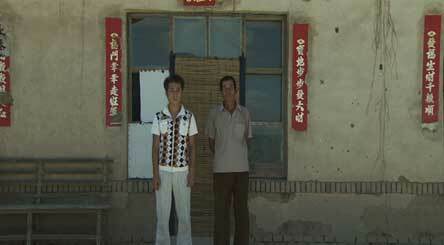 Or perhaps Fish Eyes is similar to Blind Shaft (China/Germany/HK 2003) in its depiction of bleak towns in remote areas – although that film had a clear social commentary about the scandal of deaths in the mines. Or perhaps Fish Eyes represents something new – a relatively short film (75 mins but packed with meaning in its simple scenes). It’s well worth seeing. Distributed by Benten Films, an American company without a theatrical distribution record. They seem to have the film for UK and European as well as North American distribution, so look out for it – you won’t be disappointed (but be patient). The UK distribution seems to be organised via PIAS (UK) but I can’t find anything about it yet.